Scorpions are commonly thought of as desert animals, but in fact, they occur in many other habitats, including grasslands and savannahs, deciduous forests, montane pine forests, intertidal zones, rain forest and caves. 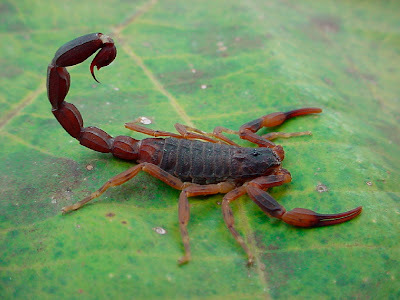 Scorpions have even been found under snow-covered rocks at elevations of over 12,000 feet in the Himalayas of Asia. 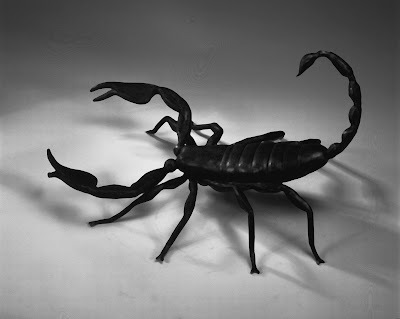 On its underside, the scorpion bears a pair of unique comb-like sense organs called the pectines; these are usually larger and bear more teeth in the male and are used to sense the texture and vibration of surfaces. 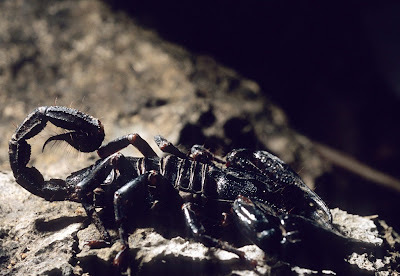 They also serve as chemoreceptors (chemical sensors) to detect pheromones (communication chemicals).The "long-tailed" African Scorpion (Hadogenes troglodytes) reaches a length of over 8 inches, and is probably the longest scorpion in the world. 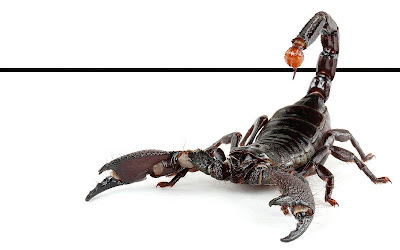 Some of the African and Asian Emperor Scorpions routinely reach (and probably exceed) 7 inches. 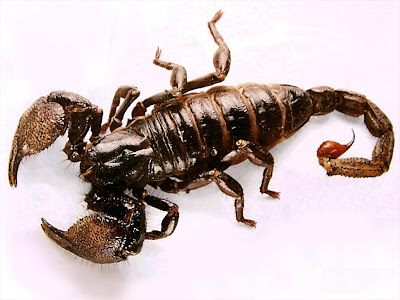 The largest scorpions in the United States are members of the genus Hadrurus (giant desert hairy scorpions), obtaining a length of about 5 inches. Giant desert hairy scorpions also occur in Arizona. As with most arthropods their activity is linked to temperature. 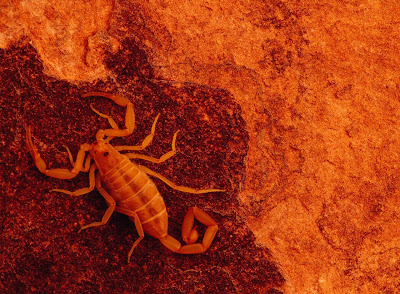 Generally speaking, scorpions are active if nighttime temperatures are above 70oF. They tend to be less active during winter and the hottest part of the summer during daylight hours. 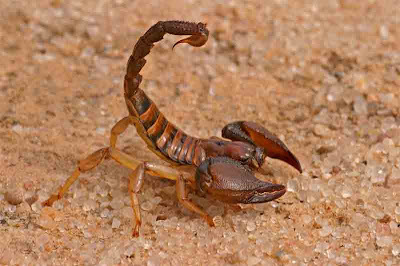 Scorpions have a complex mating ritual in which the male uses his pedipalps to grasp the female's pedipalps. The male then leads her in a "courtship dance". The details of courtship vary from species to species, with some even exhibiting a deliberate and prolonged "sexual sting" by the male. The sperm from the male is contained within a structure called a spermatophore, which is deposited by the male on a surface over which the female is pulled. The male sweeps his pectines over the ground surface to help locate a suitable place to deposit his spermatophore. The female draws the sperm into her genital pore, which is located near the front ventral (under) side of her abdomen. Scorpions have a long gestation period (from several months to over a year, depending on species) in which the young develop as embryos in the female ovariuterus or in specialized diverticula that branch from the ovariuterus. The young are born live and ascend their mother's back. She assists them by making a "birth basket" with her folded legs to catch them as they are born and to provide them with a means to climb to her back. A few Old World species do not form birth baskets. On average, a female gives birth to about 25-35 young. They remain on her back until they molt for the first time. The white colored young have been seen to climb down off the mothers back, molt then return to the mothers back for another 4-5 days before leaving for good, usually within one to three weeks after birth.Once they climb down, they assume an independent existence, and periodically molt to reach adulthood.Typically five or six molts over two to six years are required for the scorpion to reach maturity. 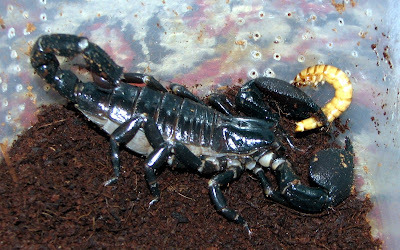 The average scorpion probably lives three to five years, but some species may live up to 25 years. 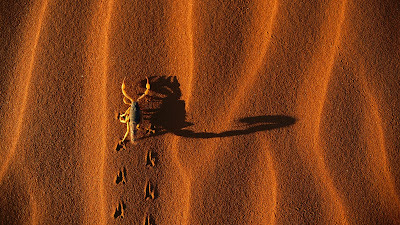 A few scorpions exhibit social behaviors beyond the mother-young association, such as forming over-wintering aggregations, colonial burrowing, and perhaps even living in extended family groups that share burrows and food. 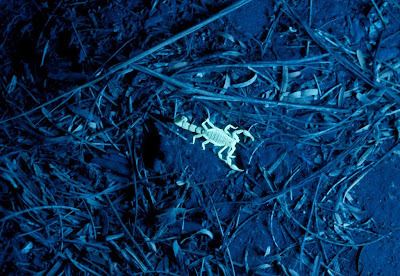 Scorpions fluoresce or glow under ultra-violate light so they are easy to find with the aid of a black light during the night. 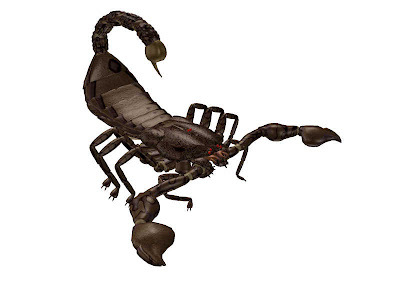 Nighttime scorpion hunting is a lot of fun but make sure that you wear high-top boots and have long tongs if you want to capture the scorpions to move them.